For custom-cut gutters in Cincinnati, Ohio, or a nearby city, look no further than the trusted, reliable, and recommended experts at Advantage Roofing & Home Exteriors. Since 2001, we have been helping homeowners like yourself update their houses to increase functionality and value, and we’ll be excited to do the same for you. Not only do we offer top-of-the-line gutters to homeowners in the Cincinnati, OH, area, but we also provide professional installation services. The expertise and dedication of our team members is made evident by our A+ rating with the Better Business Bureau. 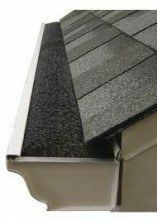 What’s more, while we are updating your gutters, we can also install gutter protection products that will block leaves, sticks, pine needles, seed pods, and other debris from entering your system. This means that you won’t have to worry about gunk collecting and creating blockages, which have to be cleaned out in order for your gutter system to work properly. To update the gutters at your home around the Cincinnati, OH, area, contact Advantage Roofing & Home Exteriors today. We’ll be happy to arrange a complimentary consultation for you. Additionally, we’re pleased to offer financing to qualified homeowners, so feel free to inquire about the different options we have available.